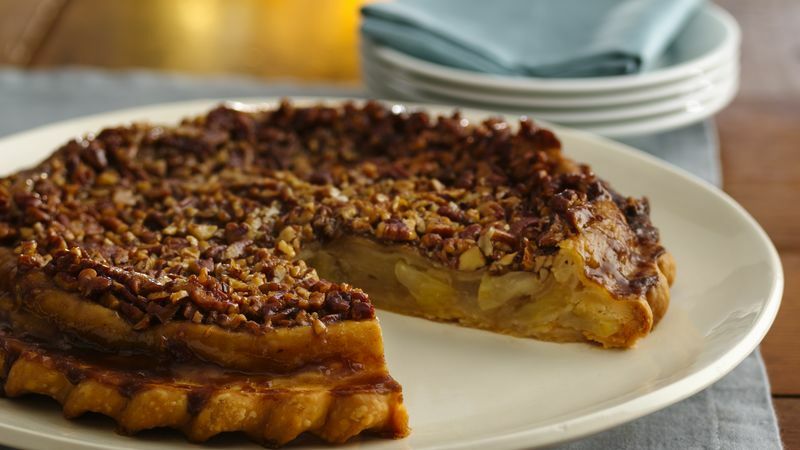 In 9-inch pie plate, combine pecans, melted butter and 1/2 cup brown sugar. Place 1 pie crust on top of pecan mixture in pie plate. In 10-inch skillet, cook apples with 3 tablespoons butter over medium-high heat 2 minutes; add the chai tea. Cover; cook 2 to 3 minutes. Add cinnamon and cloves. Drain apples and place in the pie crust; sprinkle 2 tablespoons brown sugar on top. Cover filling with second crust; seal edges and cut a few slits in top crust to allow for venting. Place pie on middle oven rack; place sheet of foil on rack below pie in case of spillover. Bake at 375°F 35 to 40 minutes or until crust is golden brown. Remove from oven; immediately turn pie upside down onto serving plate. This pie needs to be inverted immediately to avoid sticking in the pie plate.